The GX2200 MATRIX AIS/GPS, features a 66 channel WAAS GPS antenna integrated into the front panel of the radio, now there is no need to hassle with wiring the radio to a GPS for DSC (Digital Selective Calling) or AIS (Automated Identification System). Out of the box and ready to go, acquiring AIS and AIS SART targets, DSC calling, position sharing, waypoint navigation, and navigation to DSC distress calls can all be performed with just a few simple steps. The MATRIX AIS/GPS displays AIS target information (MMSI, Call Sign, Ship Name, BRG, DST, SOG and COG) allows you to contact an AIS Ship directly using DSC, shows your vessels position in relation to AIS targets and alerts you when an AIS ship may be approaching too close to your location via the Closest Point of Approach (CPA) Alarm. The MATRIX AIS/GPS includes a 30W Loud Hailer with Fog signals; Bells and Whistles with listen back. 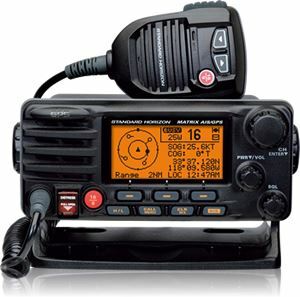 For added benefit, the last selected VHF channel can be heard when in the PA or Fog modes and the AIS Display may be accessed and used. In addition, the MATRIX AIS/GPS allows you to start a fog horn and then view the AIS page simultaneously. The GX2200 Matrix AIS/GPS shows your vessels position in relation to AIS targets and alerts you when an AIS ship may be approaching too close to your location via the Closest Point of Approach (CPA) Alarm, or Time to Closest Point of Approach (TCPA) Alarm. Need to remotely control a VHF from your cockpit of fly bridge? The MATRIX AIS/GPS is RAM3 remote mic capable to control all VHF and DSC functions at a second station. In addition, the MATRIX AIS/GPS can show AIS displays and vessel information. The Intercom feature allows communication between the main radio and the remote station. The MATRIX AIS/GPS is capable of entering and saving up to 100 waypoints. These waypoints may be selected and navigated to by using a unique navigation compass display that shows your vessels SOG, COG, BRG (Bearing) and DST (Distance) to the waypoint. Because the GX2200 is built better, it’s back better. If your Standard Horizon GX2200 ever fails for any reason including water damage during normal use in the first three years, STANDARD HORIZON will repair or replace it free, without hassle or charges…period! If it fails thereafter in normal use for the life time of the product it is covered by Standard Horizon’s Lifetime Flat Rate Service and Customer Loyalty Programs.